One of RuneQuest's strengths - and this holds true for every version of the game - is its versatility, adaptability and the way it inspires innovative, inventive and imaginative thinking. Many of these thoughts have found their way into Signs and Portents magazine and, with the advent of RuneQuest II, we decided it was time to go back to the old articles and tweak them a little to bring them into line with the new rules. We also wanted to gather the best into one place to provide a kind of RQII Companion but one based on the input of you, the gamers, rather than the Mongoose staff writers. 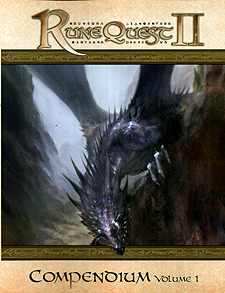 So, within the pages of theRuneQuest Compendium - and it won't be the only volume; RuneQuest Adventures will be following soon, and I'm certain we'll see a RuneQuest Compendium II appear - you will find a truly diverse range of articles that run the gamut of new monsters, through new rules additions and variants, and through to expansions for published supplements, such as the Races of Glorantha series. We've tried to keep this book as generic as possible, but we found it difficult to completely omit Glorantha material and so we have chosen to include a couple of Glorantha-focused articles.